This edited article about D-day originally appeared in Look and Learn issue number 132 published on 25 July 1964. D-day, June 6, 1944 . . . the day all German-occupied Europe has been waiting for. 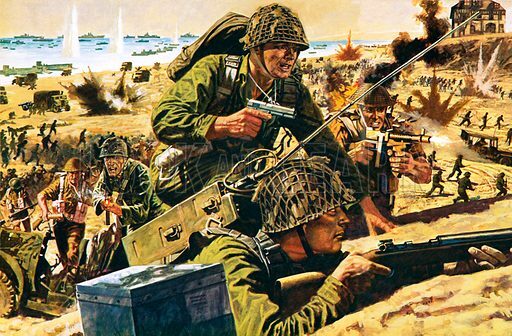 Up the sandy beaches of Normandy in western France stumble the first assault troops of a vast Anglo-American invasion force. Slipping and lurching beneath their heavy equipment in the shallow waves, the soldiers follow the guiding ropes to firmer sand, then plunge ahead up the beach under cover of fire from their own ships and planes. A stream of bullets zings out at them from a German gun-post behind the concrete defence-wall . . . and the first man falls. But his comrades press grimly on up the beach and over the wall, to capture the surprised Germans in their strongpoint. The men on the beach are the first to have crossed the Channel and landed on French soil since the terrible retreat of French and British soldiers from Dunkirk, farther up the coast, three years ago. Behind them more and more troops are flooding up the beach. Nearly three million British, Canadian and American men have been drafted to this Allied Invasion Force, for the French coast must fall into Allied hands today. It is the greatest invasion ever, planned over a period of two years as a turning-point in the Second World War. It has to succeed, if Europe is ever to be freed from the stranglehold of German occupation. The planners have studied all available information on German coastal defences and have picked the lightly-defended sandy stretches between Cherbourg and Le Havre as a suitable landing base. They have backed up their invasion forces with thousands of planes, ships, armoured vehicles and weapons. Earlier in the morning the first wave of American and British bombers attack the French coast, followed by thousands of other planes keeping up a relentless barrage. Massed parachute forces have been dropped behind enemy lines to seize roads and bridges; minesweepers have cleared a passage for the battleships which now add their bombardment of tons of shells to the heavy aircraft attack. Every type of ship, big or small, has been commandeered for the Big Lift to carry troops across the Channel. Now, at 6.30 a.m., the first assault forces commanded by General Bernard Montgomery have landed and stormed the beaches. By dusk more than 6,000 of “Monty’s” men will have died along the French coast on this mild June day. But the western blockade will have been breached and the Allied advance into Europe begun.